A shuttered chateau that only operated for 3 years? Well, if nothing else, this is a piece of history. K&L selected this as part of three L'Encantada Lous Pibous that they brought in. Fantastic nose. Soft fruit, lots of black pepper and cognac spice. Bone dry. As for the actual flavor...it's good, but not great. It's *very* tart, almost like unsweetened cranberry juice, tons of oak, and it's so dry it could extinguish the Chicago fire. Too me, it's a bit dilute and perhaps a bit over-oaked. It's softer in its style (more Cognac than Armagnac), so the oak knocks it out of focus, a bit. As well, the lower proof keeps the finish shorter. 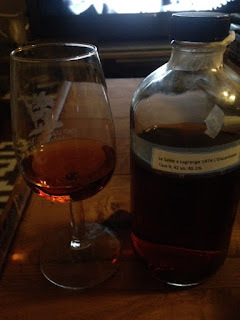 If you think of this as a subtle Cognac, it's very good. 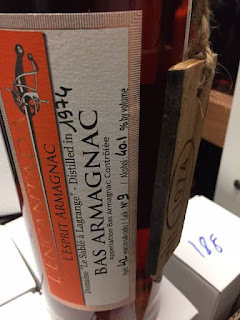 As an Armagnac, it's missing something. That said, it's solid. 85 pts/B. Not one I'd reach for constantly, but it's nice opening drink before my usual routine of frying my palate with Islays and funky pot-still rum. Sku retires his blog: resignation *not* accepted.